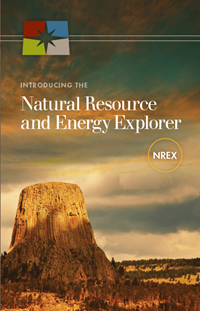 The Natural Resource and Energy Explorer (NREX) is a Web GIS-based software tool that supports pre-planning development considerations by enabling discovery, analysis and assessment of energy, environmental, cultural, socioeconomic and infrastructural assets for user-defined, project-scale areas of interest in the state. The NREX application is designed to support the Energy Atlas concept within the Governor’s Energy Strategy Initiative by providing public access to credible geographic data and information maintained by state agencies. Its primary audience includes developers, conservationists, consultants, planners, policy makers, and resource managers with interests in assessing potential place-based resource allocations. A secondary audience includes educators and the general public seeking map-based sources of information for Wyoming's natural, cultural and energy resources. NREX Mining Potential Demo Video (Vimeo): Wyoming Business Council and WyGISC's demonstration of use for potential mining in Wyoming. Click on the CC in the lower right-hand corner to view demo narrative.